No More Magic: Johnson Abruptly Resigns From The LA Lakers On Tuesday night, Magic Johnson told reporters he's stepping down after a two-year stint as the president of basketball operations for the Los Angeles Lakers. 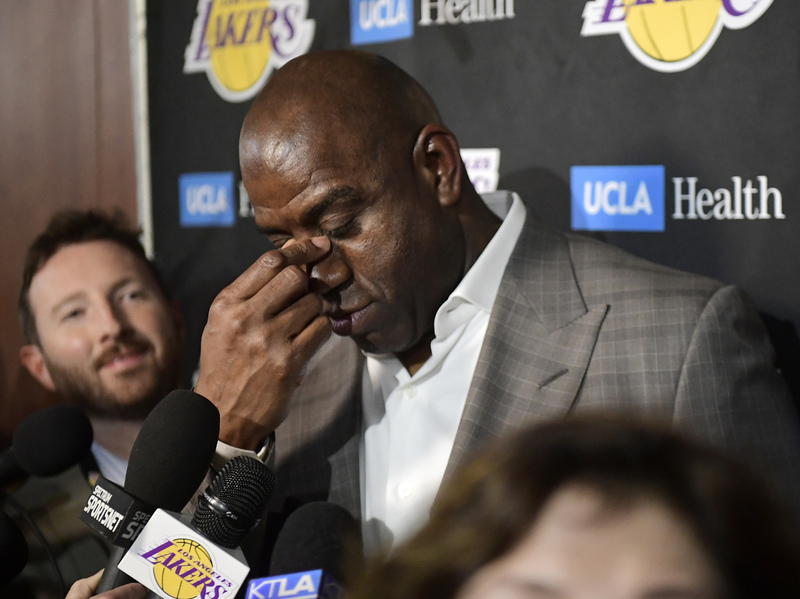 Magic Johnson fought back tears while he broke the news of his resignation from the LA Lakers on Tuesday. He said he hadn't told his boss yet because he knew he would cry "like a baby." Magic Johnson isn't having fun anymore. "Today, I'm going to step down as president," the former NBA superstar told a gaggle of reporters on Tuesday night, about an hour and a half before the Los Angeles Lakers played their last game of the season. "I was happier when I wasn't the president." Johnson has served as the team's president of basketball operations for more than two years — the latest move in a long and successful career as a businessman and philanthropist after he first retired in 1991 when he tested positive for HIV. He came back to be part of the U.S. Olympic "Dream Team" in 1992 and then again to play for the Lakers in the 1995-96 season. His resignation came out of the blue; on Monday, Johnson had a three-hour meeting about the team's future after its sixth consecutive losing season, the Associated Press reported. Reporters and basketball fans weren't the only ones to find out about his resignation late in the game. "Somebody's gonna have to tell my boss," Johnson told reporters. His boss is Lakers controlling owner Jeanie Buss, who hired Johnson just over two years ago after she dismissed her brother Jim, who was vice president of basketball operations, and General Manager Mitch Kupchak in an effort to change things up after multiple losing seasons. Johnson said he just couldn't face Buss, who he called "my sister." "Have you really not told Jeanie yet?" a reporter asked. "No, I haven't. I couldn't," he answered. "She doesn't know I'm standing here because I knew I would be crying like a baby in front of her." The Hall of Famer barely kept it together in front of the press: "I'm about to cry now," he said. When his boss inevitably heard the news, the Lakers issued a statement thanking Johnson for his time with the team. "There is no greater Los Angeles Laker than Earvin Johnson," the statement said. "He will always be not only a Lakers icon, but our family." But not everyone thought Johnson was good for the Lakers. "It's a mess," sports anchor Rob Parker said recently, calling him "tragic Johnson." "Nobody ... thought that the Lakers wouldn't make the playoffs when LeBron James came here, even with the injury," Parker said. James, who joined the LA team in July of last year, didn't comment on Johnson's resignation on Tuesday. Johnson didn't give any specific reasons for his decision to quit. He said he's happy with where the team has gone during his two years. "We're halfway there with LeBron coming back," Johnson said. "I think this team is going to be in the position to really contend for a championship with the growth of the young players." The Lakers ended their season with a loss to the Portland Trail Blazers on Tuesday night, after being eliminated from the playoff race last month. They used to be a top team, with 16 NBA titles. But they haven't made the playoffs in six years. Johnson said he is not stepping down because of differences he's had with the team's coach of three years, Luke Walton. "I like Luke a lot," Johnson said. "We have different opinions about different things — that's OK."
It's been widely reported that the Lakers were expected to dismiss Walton at the end of the regular season. Walton told reporters he didn't know Johnson was planning to quit. "I found out the same time as you guys," the coach said at a press conference after the team's Tuesday night game. However, Johnson did suggest vaguely that his departure had to do with an upcoming confrontation. "Tomorrow, I would have to affect somebody's life — ruin their life," he said. "That's not fun for me, that's not who I am." Delivering bad news — that's one of the job requirements Johnson said he doesn't like. He talked about the challenge of having to trade players that he likes. Magic Johnson just gave the longest, strangest, greatest "I'm stepping down" press conference I have ever witnessed. Just beautifully bizarre and completely contradictory. None of it made sense - except he is now so happy & so relieved to be going back to his old life. Johnson would rather be on the other side of things, helping mentor players such as tennis champion Serena Williams and the Philadelphia 76ers' Ben Simmons. But NBA rules prevent teams — including players, coaches and management — from doing anything that might entice a player away from another team they're under contract with. Mentoring another player can be construed as tampering. Johnson has been investigated by the NBA for tampering four times, including for his response to a mentoring request from Simmons in February. Also this year, Johnson incurred a $500,000 fine for "impermissible contact" with Oklahoma City Thunder player Paul George's agent, and another $50,000 for praising Milwaukee Bucks player Giannis Antetokounmpo. Johnson said he's had enough of the tampering charges. "I can't help young men who want me to help them," he said. "I don't like that; I like to be free." He also said he was tired of "the backstabbing and the whispering" associated with his leadership position. "What am I doing? I've got a beautiful life," said Johnson, laughing. "So I'm gonna go back to that beautiful life." A previous version of this story said Magic Johnson retired from basketball in 1991. He first announced his retirement then but came back to be part of the U.S. Olympic "Dream Team" in 1992 and then again to play for the Lakers in the 1995-96 season. Additionally, we incorrectly said the Lakers haven't made the playoffs in three years. The team hasn't made the playoffs in six years.